It’s almost high school and college graduation time. Growing up in Hawai’i, this time of year means making or buying leis for graduating family and friends. It’s a little harder to make a fresh flower lei here on the mainland, but I’m not willing to let my baby graduate from high school with out a bunch of leis from her family. 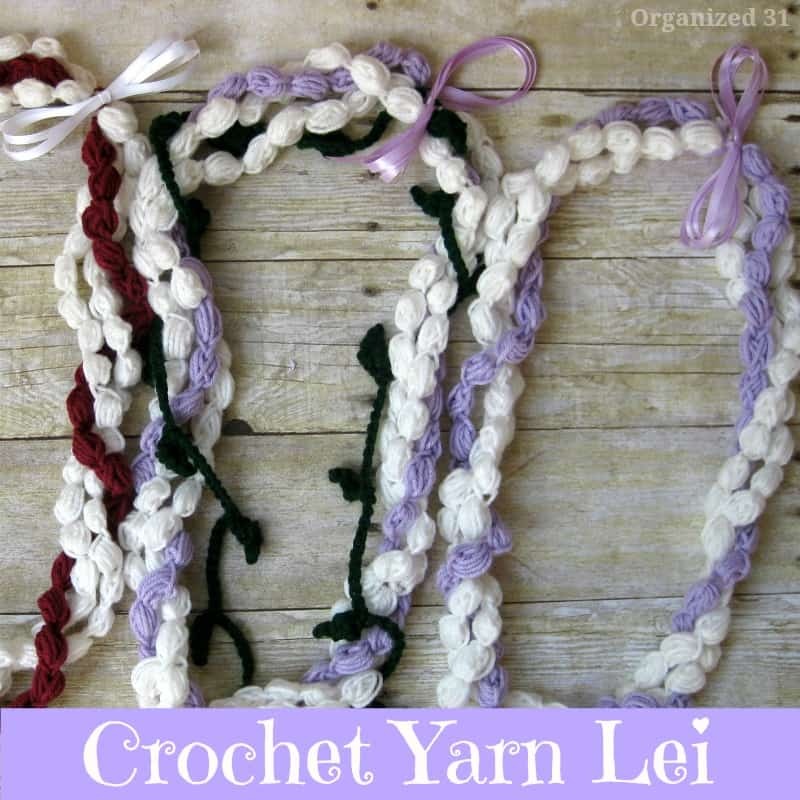 I decided to make crochet yarn leis for my daughter and her group of friends. It’s a beginner level project and a fun graduation gift to give. This lei in white resembles a pikake lei. 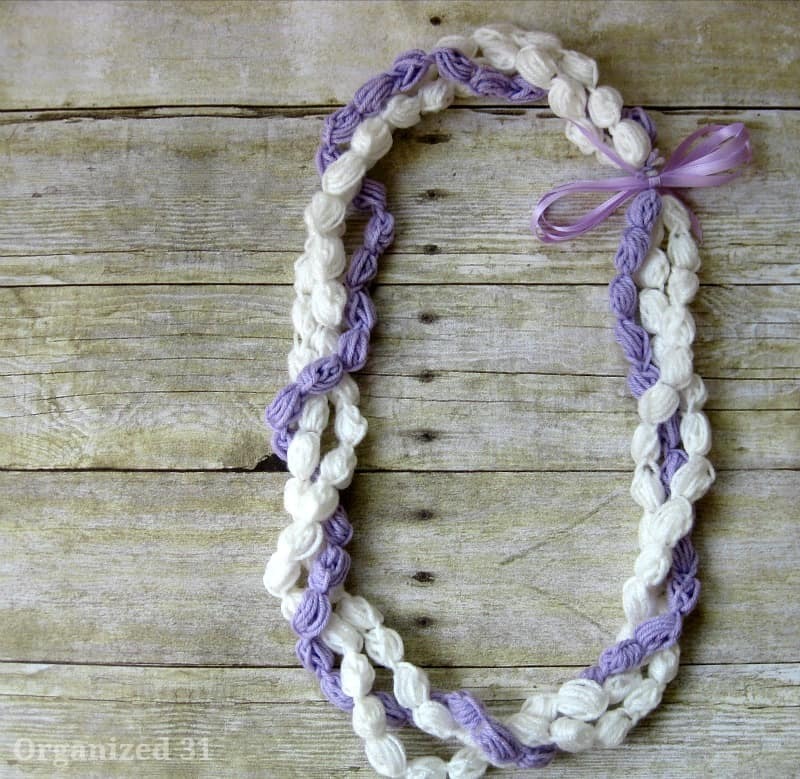 I’ve made it with 3 strands of white to look like a traditional pikake lei, but this was the perfect opportunity to use up some leftover yarn scraps and make one of the 3 strands a contrasting color. To start, chain 2, draw loop of yarn up through 2nd chain. 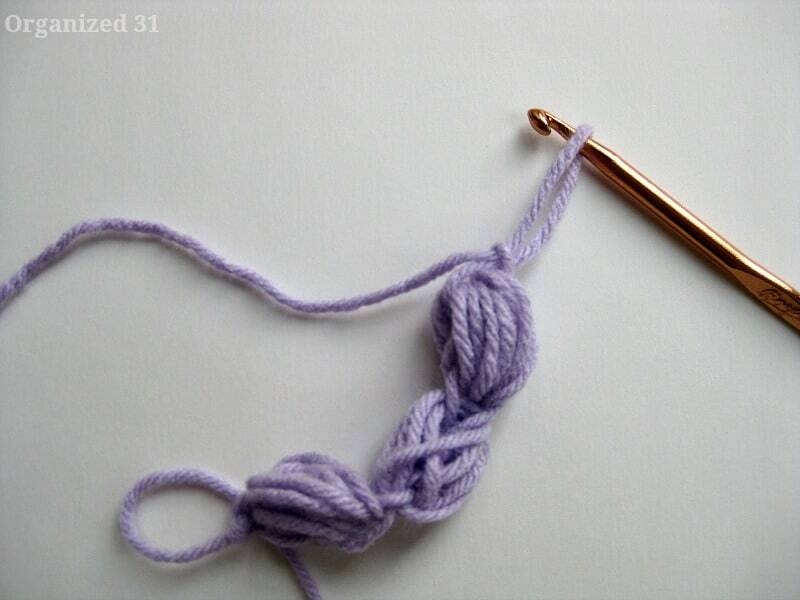 Make loop about 3/4 to 1 inch long. 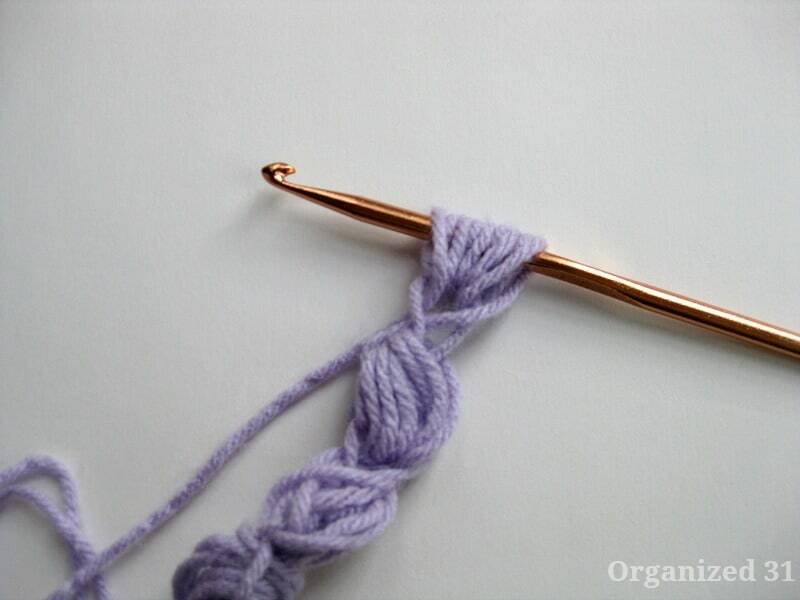 Yarn over (add another loop), and insert the crochet hook back through the same stitch. Yarn over and pull the loop through. Repeat until you have 9 loops on the hook. Yarn over and single crochet your 9 loops closed. Repeat until your lei is about 40-43″ long, depending on the height of the person you’re giving the lei to. Tie one end together and twist the strands together until you reach the other end and tie off. Tie the lei together and add a ribbon to cover the joining. I made some of the leis in the girls’ favorite colors and other leis in the school colors. 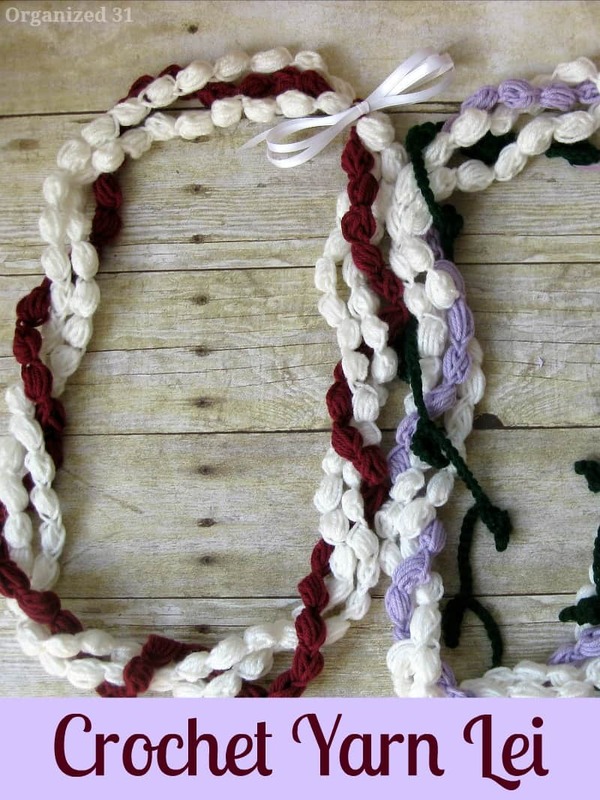 I can’t wait to surprise them at graduation with a crocheted yarn lei. 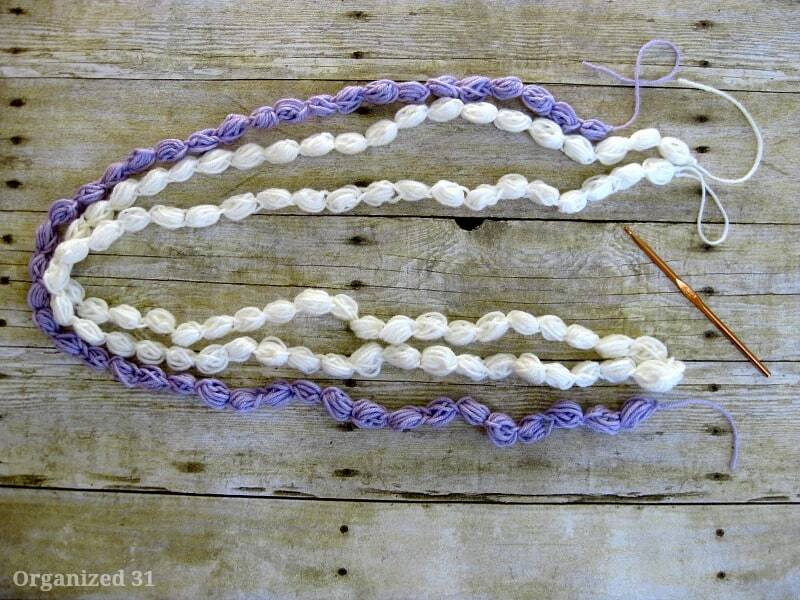 Drop by next week and I’ll show you how to crochet the green leaf strand wrapped around the middle lei. Check out the leis I crocheted last year and the lei I crafted for my daughter’s hula competition. Bobbi, it is simple and a great gift. I’d love to see your lei when you make one. I just love these! 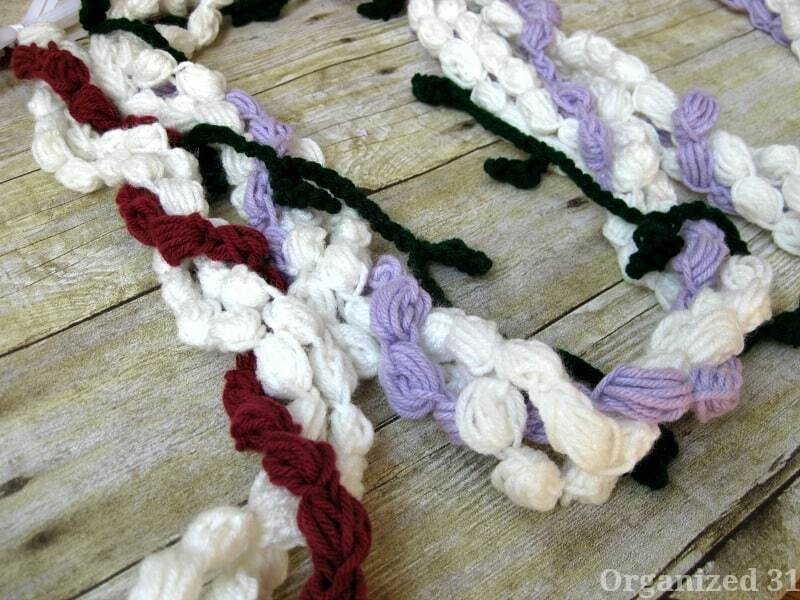 I never thought about crocheting a lei. These came out beautiful and I know your daughter and her friends will love and cherish them forever. love it! a sweet way of combining your memories with your daughters. thanks for sharing on craft schooling Sunday! Found you on Jewish Mom’s blog and have to tell you this is amazing. 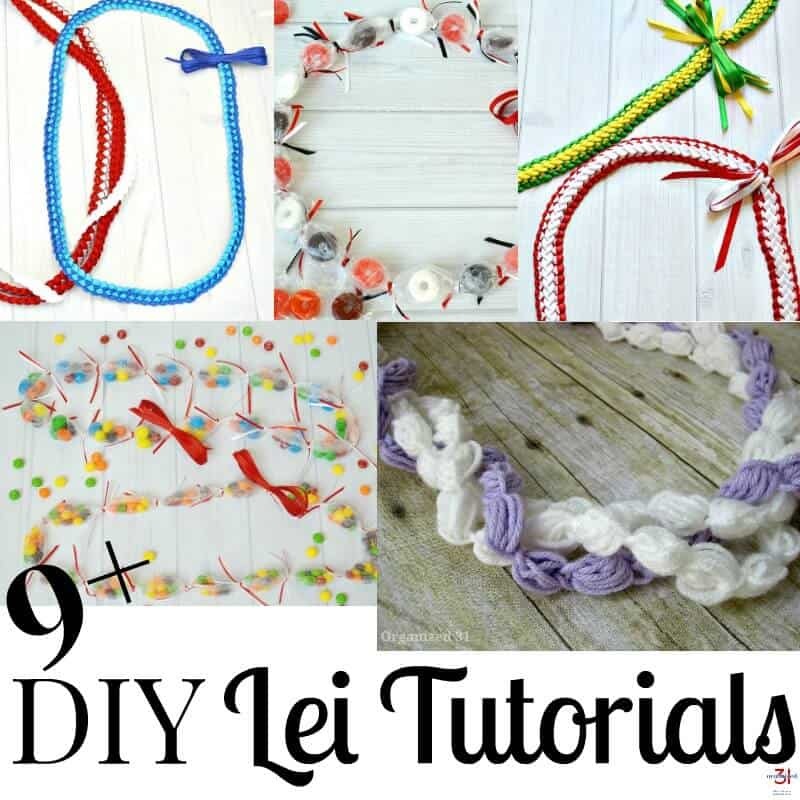 I have a daughter that loves unique scarves and I am going to adapt your beautiful lei into a scarf for her. Thanks so much for the tutorial and sharing. With a post like this, I had to subscribe. Alice, I’d love to see how you evolve the lei into a scarf! Have fun with it and welcome to Organized 31. I hope this still works. But I’ve never crocheted before and the instructions sound easy. I am a visual learner and there’s not many step by step pics or a video. Is there anyway you could make a video on how to make this? I’d be happy to, Dominique. It’ll take me some time, but I’ll get on it as soon as I can. Feel free to email me with any questions. There’s not, Mandi. I’ll try to make one, but it won’t be for a bit.